The open design of the Prologue Building at RWTH Aachen invites participants to meet up and exchange ideas for research projects. 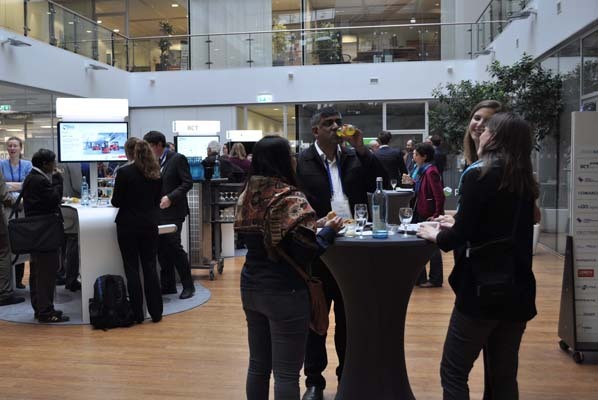 The CORNET and IraSME Partnering Event, that took place in Aachen on 26 November, brought together more than 100 participants from all over the world who shared their innovative R&D ideas and wisdom from the think tanks of various fields of research. The open design of the “Prologue building” on the campus of the RWTH Aachen University was the perfect location to let the ideas flow. As in the years before, ZENIT and the EEN network were the cooperation partners of choice. The funding networks CORNET and IraSME, who are both financially supported by the German Federal Ministry for Economic Affairs and Energy (BMWi), presented a diverse programme to give participants an understanding of their funding possibilities and to help them to network with potential partners to set up international R&D projects for the benefit of SMEs. Not a single seat was left when the funding networks CORNET and IraSME were presented. 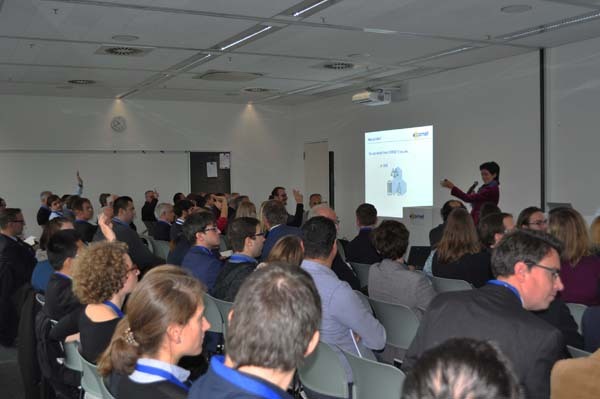 Benjamin Döbbeler, Chief Engineer in the department Cutting Technology of the Laboratory for Machine Tools and Production Engineering (WZL) at RWTH Aachen University welcomed all guests to the match making event. The programme then started with presentations of both funding networks, CORNET and IraSME, followed by talks from ZENIT, EEN network and NRW Bank who provide additional funding options. 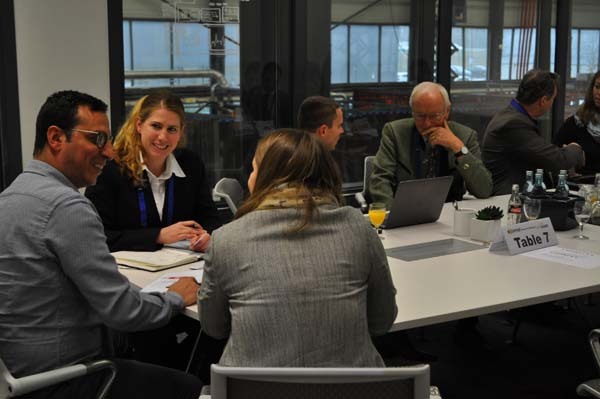 Particularly interesting for potential applicants: Marco Günther, Chief Engineer of the Institute for Combustion Engines at the RWTH Aachen University, gave some insights on his experience working together with partners within a CORNET project. He stated, that the benefits of being part of a CORNET project is shared knowledge broadening horizons, access to state of the art technologies as well as new problem solving perspectives and building up international cooperation for further research. In the further course, representatives of the German Canadian Centre for Innovation and Research (GCCIR) introduced their funding organisation accompanied by a delegation of 14 Canadian companies that gave a brief overview about their business profile and goals. The stage was now free for the “Elevator Pitch Sessions”, the heart of the event. Researchers from various fields of expertise pitched in just five minutes either a current project idea or their organisational profile. Wienke Reynolds for example, founder and CTO at LignoPure explained how her company develops sustainable and innovative products based on lignin – one of the main ingredients of wood and therefore one of the most abundant naturally occuring products. Among other things, the founders have already successfully used their high quality lignin in adhesive tapes and in 3D printing. In separate rooms, participants were able to talk in quiet about possible partnerships to jointly implement a research project. In parallel to the Pitch Sessions, several participants met up for face-to-face meetings which they had previously scheduled via the registration tool. This exchange on a personal level is a great opportunity to find the right partners and necessary international know-how to implement future CORNET or IraSME projects. The open, welcoming design of the facilities was also a perfect platform for spontaneous conversations and networking. The 27th CORNET Call for Proposals is open until 27 March 2019. Proposals can be submitted online via the CORNET Submissions Tool. CORNET and its partner network IraSME will be again hosts of the “International Area” at the Innovation Day for SMEs – a traditional open-air fair where successfully funded innovation projects are being presented very vividly. The event is annually hosted by the BMWi on the garden grounds of the AiF Projekt GmbH in Berlin-Pankow.